Beyond the tantalizing aromas emanating from the kitchen, scent can be a powerful tool for restaurants. For decades, the foyer of chef David Bouley’s now-shuttered eponymous Tribeca flagship made a memorable first impression with its towering shelves of fragrant apples. Vespertine, Jordan Kahn’s avant-garde fortress of sensorial dining in Los Angeles, sends people home with vials of the same anise-spiced fragrance that’s pumped into the dining room. 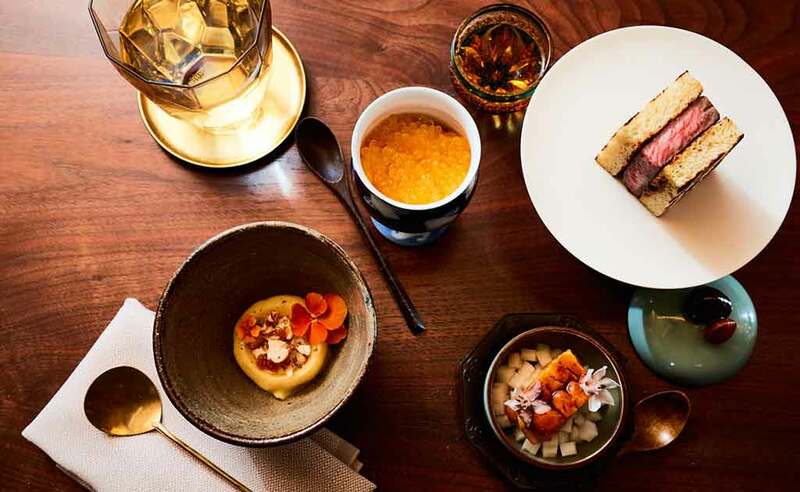 And at Uchu, a discreet Lower East Side refuge for Japanese fine dining that opened last spring, diners first huddle in a cedar-scented, wood-paneled vestibule entrance before being let into the restaurant by one of the hosts. The brief moments spent in this calming ligneous antechamber are an overture for two of the more quietly confident luxe meals to come along in the past year. “Two” because Uchu is home to a pair of distinct and complementary (and abrasively costly) chef’s tasting endeavors. The larger space up front is the domain of Tokyo-born sexagenarian Eiji Ichimura, a salient figure in the city’s sushi scene known for his creative approach to aging fish and penchant for layering slabs of fatty tuna the way Steve Bannon wears shirts. Here he presides over a surprisingly sprawling ten-seat counter in a stately neutral-toned room, serving an omakase of small plates and fifteen or so pieces of sushi for $300 with gratuity included. It’s a plutocratic sum, and one that makes Uchu the second-most expensive of its kind in New York City, after Masa. Owner Derek Feldman (no relation), who also operates budget omakase spot Sushi on Jones, has unabashedly taken aim at a higher tax bracket. For his part, Ichimura, having rebounded from kidney surgery last year, is back with a wellspring of good ideas. Among them: pairing monkfish liver with gingko nuts, and stuffing sea urchin and hairy crab into impossibly light mochi rice wafer sandwiches. But unless you’re a nigiri nerd crossing sushi deities off a bucket list, or a person for whom dropping three Benjamins on dinner is no big deal, Uchu’s more compelling draw is its $200 multicourse kaiseki meal tucked away in the back of the restaurant. Though maybe not if you’re a teetotaler. One of the ways Uchu stands out among its kaiseki contemporaries is in its fondness for Japanese drinking customs. Rather than being plopped in front of an open kitchen to watch the cooks hurry about, the eight diners sitting in this area are stationed around an L-shaped bar modeled after the smoky cocktail dens of Tokyo’s upscale Ginza district. To that effect, both dining rooms feature curved wood ceiling fixtures that give the impression of sitting beneath giant whiskey or sake barrels, and in the back, shelves of antique glassware and a backlit tower of Japanese whiskey lends even more whimsy to the aesthetic. On a recent night, a woman half-snickered to her friend, “It’s chemistry. He’s making potions,” as beverage director Jake Riley piped smoke into one of his $26 drinks — this one an Old Fashioned riff with notes of cinnamon and, not unwelcomely, raspberry. And while you can spring for a $125 booze pairing, even if you stick to water you’ll be handed a seasonal aperitif to kick things off, and a cocoa-scented Brandy Alexander to go with the final bite of dark chocolate filled with soy sauce–infused caramel. Kaiseki is a seasonal pursuit, so in autumn a tart mix of rice shochu, concord grape syrup, and champagne might precede introductory bites of Hokkaido sea urchin mounded over soft tofu blushing orange from pumpkin and zinged with ginger. Months later, with citrus at its peak, fresh bergamot embellishes the bubbly instead, and the uni’s been pressed into masterful bricks balancing on cubes of celery root and sweet raw scallops that accentuate the briny gonads. It’s a smashing way to start, though its impact undercuts mellower successive tastes, like solitary slices of goldeneye snapper sashimi with mild myoga ginger, or a single marinated-then-grilled potato dabbed with salty bonito flake cream and speared onto a tiny fork. This sometimes overly precious cooking is the work of Samuel Clonts, alum of three-Michelin-starred Brooklyn Fare, one of the city’s most lavish chef’s tasting temples that now commands just under $400 for dinner. But Uchu harks back to that restaurant’s spunkier beginnings, when the chef’s former boss César Ramirez — a Bouley veteran — charged less and cultivated a less imposing, more relaxed atmosphere despite plenty of classic luxuries. Here, the procession’s crescendo includes back-to-back caviar service, starting with cups of saline golden trout roe gleaming atop silky soft-scrambled, dark-yolked Jidori chicken eggs. Then Clonts emerges with seasoned rice, sheets of nori seaweed (which he swiftly crisps on a portable grill), and a tub of golden ossetra caviar in order to twist up absurdly overflowing hand rolls. Their pure oceanic brine and creaminess is as invigorating as leaping into a crashing wave. Following this are two takes on Japanese favorites. One’s an homage to homey katsu curry that might star ultra-sweet red prawns or buttery sweetbreads in a gently spiced sauce; the other is a rendition of a trendy sandwich made with meltingly tender dry-aged Miyazaki A5 wagyu squished between toasted slices of house-made milk bread. It comes with a side salad, a cheeky move for such a serious meal that pays off in spades. Clonts reappears for a savory finale of…rice, though at least he’s nice enough to festoon it with earthy pine mushrooms or foie gras, upon which he then vigorously shaves whichever truffles are in season. These grains are some of the most considered in New York, with an umami-like meatiness and a musky aroma that recalls a rain-soaked forest floor (in the best possible way). Mandarin sorbet with sweet white miso tastes like if Jiro dreamed of creamsicles, and a scattering of crunchy candied cashews make the palate cleanser feel more like an actual dessert. On a recent evening, Boz Scaggs’s “Lowdown,” a song about flirting with the high life, played over the stereo as the chef materialized a final time to scoop ice cream onto technically perfect (if straightforward) chocolate soufflés as rich and smooth as the crooner’s voice. Before long, I was out on the sidewalk and back to reality, but at least I had Uchu’s parting gift — a jewel box of fruit jellies that put me right back at this intimate downtown boîte when eaten the next day.